Buckland is a village and large civil parish about 4 miles (6.4 km) northeast of Faringdon in the Vale of White Horse District. Buckland was part of Berkshire until the 1974 boundary changes transferred it to Oxfordshire. The 2011 Census recorded the parish's population as 588. The parish is an irregular shape, measuring about 3 miles (5 km) north – south and 2 3⁄4 miles (4.4 km) east – west at its widest point. In 1924 the area of the parish was 4,505 acres (1,823 ha). The River Thames forms the northern boundary of the parish, just over 1 mile (1.6 km) north of the village. Until 1974 this was also the Berkshire county boundary with Oxfordshire. Streams that flow into the River Ock form its southern boundary. It is bounded by field boundaries to the east and west. The soil of the parish is a rich, sandy loam on a geology of Corallian Limestone and Oxford Clay. 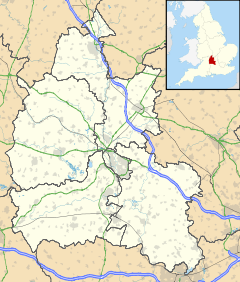 "Buckland" is a common toponym in southern England. It is derived from the Old English bōcland — bookland — which is a term in Anglo-Saxon law for "land held by charter". The earliest known record in this case is as Bocland in a charter from AD 957 now reproduced in the Cartularium Saxonicum. The Domesday Book of 1086 records it as Bocheland. Later spellings include Bochelanda in the 12th century, and Boclonde, Bokeland and Bikeland in the 13th century. The earliest known record of Buckland is from AD 957 in a charter in which King Edgar the Peaceful granted Ælfheah ten hides of land at Buckland. In the reign of Edward the Confessor (1042–1066) Ulvric Chenp held the manor of Buckland. The Domesday Book of 1086 lists Buckland as part of the lands of Bishop Osbern of Gamesfel Hundret (now called Gainfield). However, his right was not established and the case had already been sent before King William the Conqueror. The estate was assessed as eight hides and consisted of a mill, four fisheries and a dairy farm producing 10 wheys of cheese a year. Its value was given as £8. Hugh de Buckland is recorded as the next holder and occupier of the manor, as well as another estate in Buckland. At the end of the 12th century William de Buckland, probably the great-grandson of Hugh de Buckland, held the manor. He died about 1215 leaving three daughters by his wife Maud de Say as his heirs – Maud d'Avranches, Hawise de Boville and Joan de Ferrers. His Buckland estate passed to Maud, wife of William d'Avranches. They had a son William and daughter Maud d'Avranches. William died childless in 1236, by which time his sister Maud had married Hamo de Crevecoeur. In 1245, they bestowed the manor on their daughter Agnes and any future heirs. Hamo de Crevecoeur died in 1263, survived by their daughters Agnes, Eleanor and Isabella: Iseult (who had married Nicholas de Lenham) died before her father leaving a son John, aged 12 in 1263. Buckland was assigned to Iseult's portion, to descend to John de Lenham as her heir. In 1263, wardship of the manor of Buckland was granted to Eubold de Montibus, from whom it passed in turn to Philip Bassett until John came of age. In 1267 John de Lenham took possession. Before 1545 the manor of Buckland was held by the De La Poles, Dukes of Suffolk. In 1545 it passed to the Yate family. In 1690 it passed by marriage to the Throckmortons of Coughton Court in Warwickshire. They went on to build much of the current estate. In the mid-1750s, Sir Robert Throckmorton had a new house built, Buckland House. The old manor house became his stables. For the later history of the manor, see Buckland House. Buckland House is a large Georgian stately home and the manor house of Buckland. It is a masterpiece of Palladian architecture designed by John Wood, the Younger and built for Sir Robert Throckmorton in 1757. Buckland Manor House was built about 1580. It was the manor house until 1757, when Buckland House was built. The old house was then converted into stables, and re-faced in Georgian Gothic Revival style with turrets and battlements. In the middle of the 20th century the building was converted back into a private house. Barcote Manor or Park is a Tudor Revival house built in 1876 for Lady Theodora Guest. She sold it to the millionaire, William West, Director of the Great Western Railway, in 1881. It later became a boarding school, the Barcote School of Coaching, and has now been converted into flats. A previous building on the site was the home of the Holcott family from 1230 to 1586. Carswell Manor is a gabled house built early in the 17th century for John Southby, who was both JP and MP for Berkshire. Major additions were made in the Victorian period. The Southbys lived here from 1584 to 1892. The Church of England parish church of St Mary the Virgin is largely a 12th-century building, with 13th-century chancel, tower and transepts, a 14th-century octagonal baptismal font and some minor Victorian additions. The main north and south nave doors are unusual in having a matching pair of Norman arches. Also in the church is a late 12th-century Crusader chest. In the chancel is a triangular locker containing the heart-burial (1575) of William Holcott of Barcote Manor. He was a staunch Protestant who only just avoided being burnt at the stake by Mary Tudor. After the Reformation, he became a zealous lay preacher, often gracing the pulpit in his "velvet bonnet and damask gown...sometimes with a gold chain". Other monuments in the church include a number of 14th century tomb recesses, an inscribed slab with a floriated cross to Dame Felice la Blonde and a number of monuments to the Yates of Buckland Manor, including the brass of John Yate (1578), and hatchments of the Throckmorton family. The Barcote Chapel has a decorative mosaic, made in 1890–92 in memory of Clara Jane, wife of William West, of Barcote Manor. The crossing tower had a ring of six bells until 1915, when they were increased to eight by the addition of a new treble and second bell. In 1636 Roger I Purdue of Bristol cast what are now the fourth, fifth, sixth and seventh bells. In 1721 Abraham II Rudhall of Gloucester cast the tenor bell. Mears and Stainbank of the Whitechapel Bell Foundry cast the third bell in 1898 and the new treble and second bell in 1915, and recast the seventh bell in 1960. St Mary's has also a Sanctus bell that John Warner and Sons of Cripplegate cast in 1854. St Mary's church is a Grade I listed building. Its parish is part of the Benefice of Cherbury with Gainfield. St George's Roman Catholic Church is a Gothic Revival building, completed in 1848 for the Throckmortons of Buckland House. It has a chancel, north chapel, nave, south porch and western bell gable. In 1240 an almshouse was founded and stood in a place now called Warnfords. In 1793 Henry Southby of Carswell House founded a free school for boys and girls in Buckland. Others contributed further funds for the school and in 1868 it had an income of £60 per annum, £40 from Henry Southby and £20 from other charities. Buckland has two pubs. The Lamb Inn in the village is a 16th-century building that was extended late in the 19th century. A restaurant was added toward the end of the 20th century. In 2008 the Lamb Inn was owned by Peta and Paul Barnard, former owners of The Plough at Clanfield which won a Michelin star. The Trout Inn is an 18th-century building 1 mile (1.6 km) north of the village, by Tadpole Bridge on the Thames. Buckland had a post office that reported to Faringdon. A photograph sold by a commercial website shows the post office in existence in 1965. The building is unow a private home called the Old Post House. The former Draper's shop, built in the 18th century, is now a house called Hedges. Various sources have been collated by the University of Portsmouth and others to give an insight into Buckland in the 19th and 20th centuries. The information quoted is for the civil parish of Buckland as defined at each period. The earliest published figure for the population of Buckland is from the 1801 Census, which recorded it as 727 people. The population increased until the 1851 Census, which recorded 987 people living in the parish. Thereafter was a decline until the 1901 Census recorded Buckland's population as 665. It varied a little over the next 50 years, and the 1951 Census recorded a decline to 636. The 1971 Census recorded a rise to 597. The 2001 Census recorded the population as 553, of whom 292 lived in the village itself. Buckland was a site for the Survey of English Dialects in the 1950s. and o'er the sedge grown meadows poured the floor. ^ "Buckland Parish". nomis. Office for National Statistics. Retrieved 29 August 2018. ^ Loyn 1962, p. 171. ^ a b Ford, David Nash (2001). "Buckland Park". Royal Berkshire History. Retrieved 19 September 2008. ^ 'Avranches', in J.R. Planché, A Corner of Kent: or, some account of the parish of Ash-next-Sandwich (Robert Hardwicke, London 1864), pp. 260-64, and pp. 42, 44, 46, 49. ^ 'Inquisitions post mortem: XXXV. Hamo de Crevecuer, 3 April & 3 June, 47 Henry III (1263)', Archaeologia Cantiana III (1860), pp. 253-264 (Society's pdf pp. 13-24). ^ "The Dovecote: History". Retrieved 18 September 2008. ^ Ford, David Nash (2002). "Barcote Park". Royal Berkshire History. Retrieved 3 October 2008. ^ a b Davies, Peter (24 March 2010). "Buckland S Mary V". Dove's Guide for Church Bell Ringers. Central Council for Church Bell Ringers. Retrieved 21 April 2016. ^ Historic England. "Church of St Mary (Grade I) (1181905)". National Heritage List for England. Retrieved 21 April 2016. ^ "Buckland – St Mary the Virgin". The Benefice of Cherbury with Gainfield. Retrieved 29 August 2018. ^ Historic England. "Roman Catholic Church of St George (Grade II) (1048662)". National Heritage List for England. Retrieved 21 April 2016. ^ Historic England. "The Lamb public house (Grade II) (1284937)". National Heritage List for England. Retrieved 29 August 2018. ^ a b "Cotswold Review: The Lamb Inn" (PDF). Retrieved 18 September 2008. ^ Historic England. "The Trout Inn (Grade II) (1368378)". National Heritage List for England. Retrieved 29 August 2018. ^ "Buckland, Square and Post Office c 1965". Francis Frith. Retrieved 20 September 2008. ^ "My Vale Information". Vale of White Horse District Council. Retrieved 20 September 2008. ^ James C Penny. "Hedges" (PDF). Retrieved 1 October 2008. ^ "Buckland AP/CP – Total Population". A Vision of Britain Through Time. Retrieved 20 September 2008. ^ "Area: Buckland CP (Parish): Parish Headcounts, 2001". Neighbourhood statistics. Office for National Statistics. Retrieved 14 September 2008. ^ "Buckland AP/CP – 1831 Occupations By Status". A Vision Of Britain Through Time. Retrieved 20 September 2008. ^ "Buckland AP/CP – 1831 Occupational Categories". A Vision Of Britain Through Time. Retrieved 20 September 2008. Ekwall, Eilert (1960) . Concise Oxford Dictionary of English Place-Names (4th ed.). Oxford: Oxford University Press. Buckland. ISBN 0198691033. Hamilton, NES, ed. (1868). The National Gazetteer of Great Britain and Ireland. London: JS Virtue. Loyn, HR (1962). Anglo-Saxon England and the Norman Conquest. Social and Economic History of England. London: Longmans, Green & Co. p. 171. Page, WH; Ditchfield, PH, eds. (1924). A History of the County of Berkshire. Victoria County History. 4. assisted by John Hautenville Cope. London: The St Katherine Press. pp. 453–460. Pevsner, Nikolaus (1966). Berkshire. The Buildings of England. Harmondsworth: Penguin Books. pp. 103–106. Wilson, John Marius (1870–72). Imperial Gazetteer of England and Wales. Edinburgh: A Fullarton & Co.
Wright, Andrew SN (1996) . The History of Buckland in the County of Berkshire. Oxford: Holywell Press. Wikimedia Commons has media related to Buckland, Oxfordshire. This page was last edited on 3 September 2018, at 19:52 (UTC).